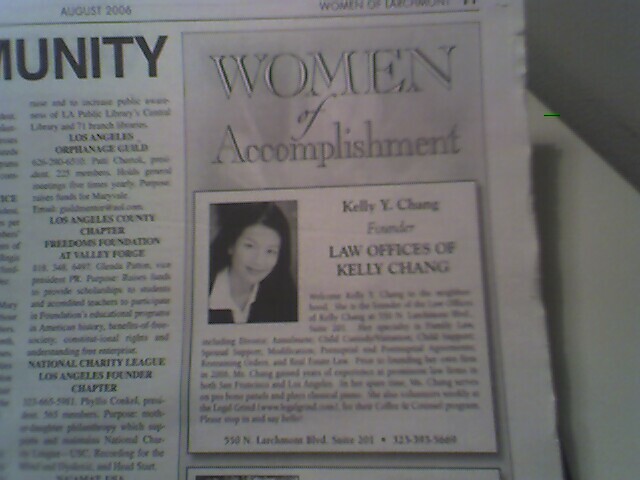 * November 2006 – Attorney Kelly Chang appears as guest star on exclusive Los Angeles radio show to discuss family issues. * October 2006 – Attorney Kelly Chang receives Custody Match Certified Attorney membership.Custody Match is an online service that helps consumers find pre-screened divorce lawyers and family law attorneys in Southern California. * September 2006 – Attorney Kelly Chang’s jury trial appears in Verdict Search. * June 2006 – Attorney Kelly Chang on Lisa’s It-List, CBS. Got a small legal problem? Don’t know where to find a lawyer? Click here to see Attorney Kelly Chang’s counseling schedule at the Legal Grind.